Still, I managed to finish a number of huge, complex and challenging models, such as my Crawler Crane which was over 2 meters tall and still able to drive on its own, my third and – I believe – final take on the iconic Hummer, and Tiger XL, my first tank model in well over a year, which proved to me that I still have plenty of things to try in the tanks category. 2014 was the year that saw some improvement in my documenting work. I am now publishing not only videos, but also all photos in full HD resolution and I started to publish them on Flickr too. I have also acquired paper backdrops in several colors, going beyond my black-or-white routine, and I started using diffused light for both videos and photos, which seems to produce better results in vast majority of cases. 2014 was the last year that saw me still using primitive paper + duct tape method for making stickers. Starting with my Mustang Gymkhana in 2015 I stepped up my “stickers game” by switching to printing them directly on sticker paper, and shortly after, with my Hyster Forklift, I moved one level up, to using sticker foil: both transparent and white one. 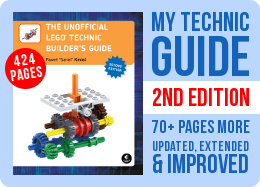 It’s my intention to rely on the combination of both – transparent foil doesn’t allow to print white elements and doesn’t cover up the color of piece below it completely, while the white foil is close to the quality of the original Lego stickers, but can’t have see-through sections, meaning that it needs to have some sections either cut out, or filled with color matching that of the Lego piece, which is tricky even for the Lego company to achieve. 2014 was in several ways a creative year. I’ve managed to try several new things, such as building my own heavy-duty tracks that proved to perform quite well outdoors, in vehicles such as my Ripsaw XL. I got back into building boats, resulting in three projects one of which was my fastest watercraft up to date (and also my first one that partially sank), while the other two were more or less successful attempts at alternative propulsion systems: an airboat and a paddleboat. Another new thing that I’ve tried was more controversial: I somewhat loosened my approach to Lego purism. I still didn’t cut or paint any Lego pieces (other than custom chroming them), but I decided to try out some new possibilities that also attracted other builders before me. There were three of them: using LEDs by Lifelites, putting third-party tires on Lego rims and using custom 3D-printed pieces. 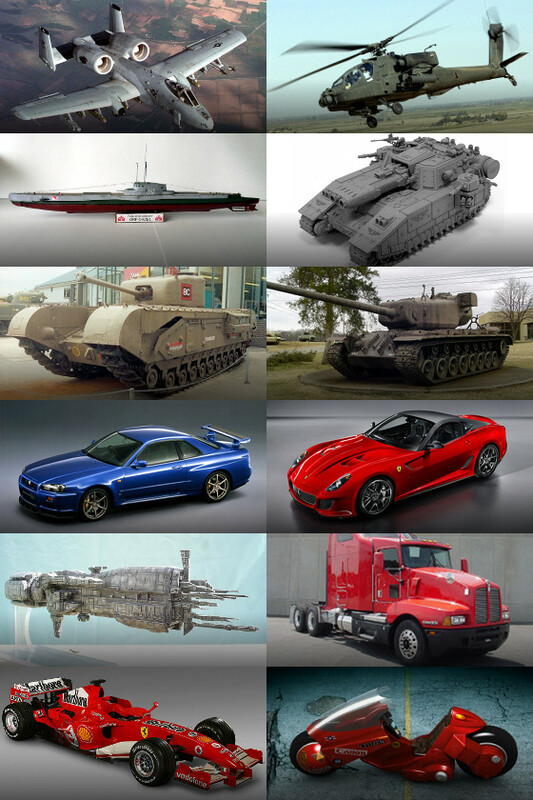 None of these possibilities is accepted by strict purists and my attitude to them is diverse. LEDs by Lifelites were designed from the beginning to use with Lego pieces. They provide an interesting alternative to Lego LEDs, especially since Lego released one type of LEDs years ago and stopped there. The Lifelites LEDs can fit into smaller pieces, take less room in general, have their own, very compact power supplies, and – most importantly – offer a number of various blinking patterns, including even a special LED variant designed to imitate a flame. 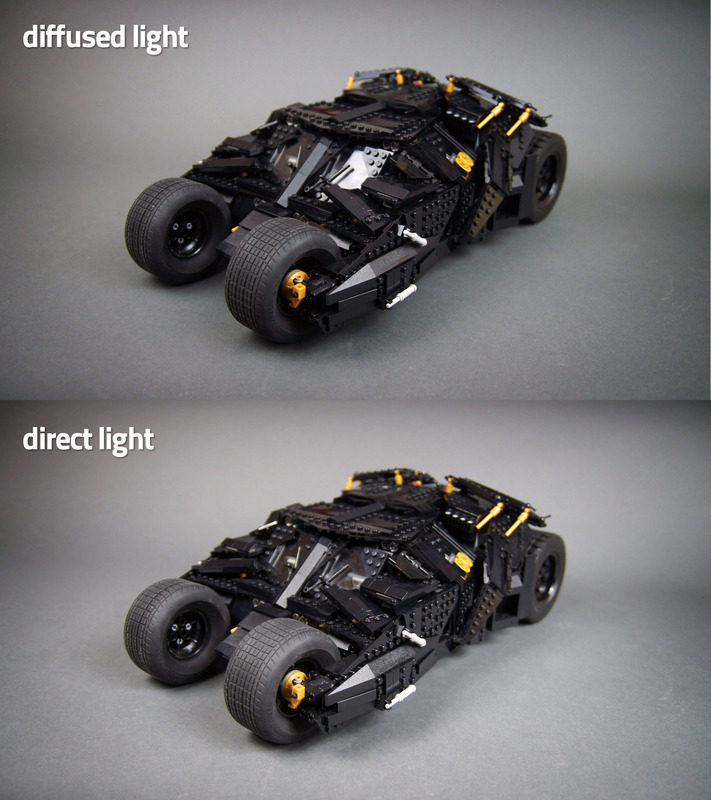 I decided to use them sparingly, trying to only resort to them when something can’t be done in a reasonable way with Lego LEDs and so far they’ve seen a fairly limited use in my creations, starting with my Batpod which was simply too small to use Lego LEDs in it. I don’t feel quite comfortable using them, so at this moment I mostly use them in small models, where Lego LEDs often just won’t fit in. Such models can benefit greatly from a few LEDs, and if my choice is: Lifelites or nothing, then I’d rather go with Lifelites. I’ve made plenty enough of LED-less models before only because Lego chose to stop any development in this area. The third-party tires are controversial too, but they’ve been growing more and more popular recently. This results from two facts: first, Lego makes a somewhat limited selection of tires these days, and many of them simply don’t look like real-life tires, usually because their proportions or their tread look wrong. 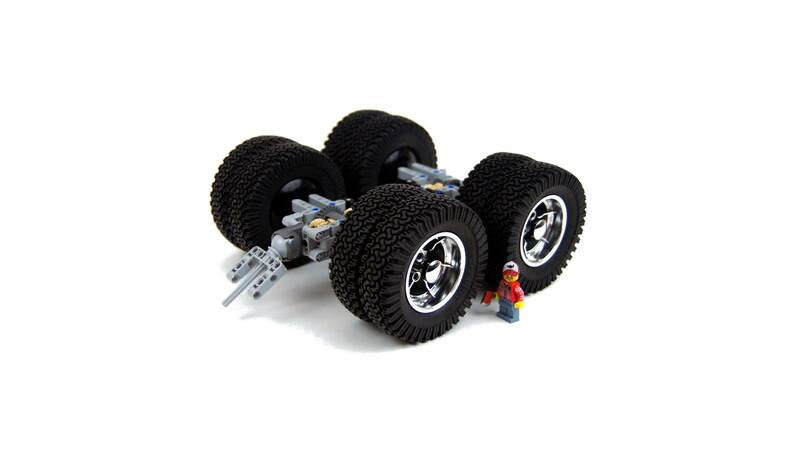 Second, the popular Lego 56 mm x 34 mm rims fit many tires designed for RC models in 1.9″ standard comfortably. At this point I have four various types of such tires myself and they all fit reasonably well. They also look much more realistic than Lego tires do, especially when it comes to building large trucks, where the only Lego choice, the 94.3 x 38R tire is clearly too wide. Additionally, the RC tires are much more rubbery than Lego ones, ensuring much better grip. I suspect this means they wear down faster in return, as the Lego tires appear to be almost everlasting, but this remains to be seen – at this point I haven’t experienced any noticeable wear on third-party tires. The improved grip, however, means that using non-Lego tires affects performance. I would be more comfortable thinking that I use non-Lego elements for aesthetic reasons only, and this is in fact my primary reason for using third-party tires, but the fact remains that they provide better traction and this alone can make them unacceptable to many Lego builders. The 3D-printed parts, finally, are the least acceptable in my book. The printing technology these days delivers surprisingly high quality and I’d say some 3D-printed gear wheels are pretty close to the quality of the original Lego pieces. Still, using such pieces seems like making things too easy, even though they open undeniably amazing possibilities. I have ordered a batch of such elements, mostly designed by Efferman and printed by Shapeways, just out of curiosity, to test them. 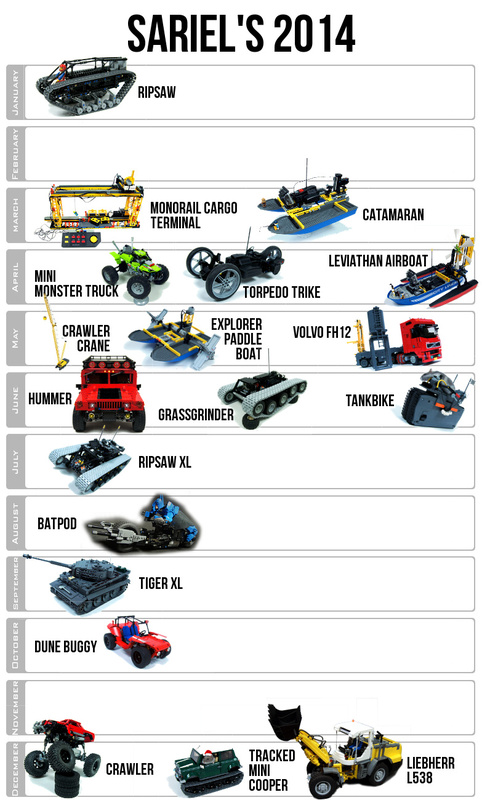 At this point I have no intention of using them on regular basis – more likely in some highly experimental creations which would be made specifically to see what can be done by abandoning pure Lego building, such as my Dune Buggy. I’m still thinking they can be acceptable for strictly aesthetic reasons in some very rare cases – for example when building a car with very distinctive wheel covers that simply can’t be properly recreated with Lego pieces. This would have no real impact on such car’s performance, yet it would do a lot for its appearance. Still, I suspect this is something that can raise some eyebrows. At the root of all these non-Lego experiments is the fact that Lego introduces new elements very rarely, and often deliberately limits their applications. However, we are finally about to get some new pneumatic elements in 2015, so perhaps things are changing for the better. The last thing I’m really happy I did in 2014 was upgrading my various tools and bringing them together to be conveniently available under a single address, tools.sariel.pl. There were five of them as the year ended, but perhaps in the future there will be more. 2014 was also the year when my habit of building several things at the same time got out of hand, bringing the number of creations in progress up to as much as 10. This is partially result of several very large projects, most prominently A-10 Thunderbolt II and ORP Orzeł having been put in mothballs for quite some time. I started to see this as a problem that impairs my building process and in 2015 I would like to fix that. Firstly, there are three tables that make my workshop and one of them has become completely cluttered with mothballed creations. I’m in the process of cleaning it up now, there’s some progress and I’d like to clean it up completely, but that will require finishing the two aforementioned big projects. Secondly, I would like to try and stick with self-imposed rule of building no more than three creations at the same time. Three seems like a number that won’t let me get bored with building, but at the same time it will prevent me from getting into mess of large numbers of unfinished creations. So at the moment, my important goal for 2015 is to go down to three “Works In Progress” and stay there. This means that when it comes to 2015 plans, I really want to focus on finishing all the projects I’ve started. It may be surprising that I’m planning 12 projects for 2015, which is more than I did for 2014, but this is specifically because most of these are already works in progress. If I manage to finish 9 of these and end the year with no more than 3 unfinished creations, I will have reached my goal. Other than the A-10 and ORP Orzeł projects which I’ve already addressed, and which will both need plenty of time and money to get finished, there are: AH-64 Apache, my first attempt at a helicopter intended to be relatively small, scaled down to match the size of the Lego 9396 set‘s rotor blades. It’s perfectly possible that due to the small size only the rotor rotation will be motorized, and this model will also call for some stickers and probably Lifelites LEDs. Then there’s Warhammer Stormblade, which will be an opportunity to try some ornamentation that real-life tanks don’t allow, perhaps with some LEDs, EL wire and firing mechanism. This is accompanied by two WW2-era tank models: Churchill Mk. IV and T29. Churchill will be pretty simple model mechanically, but I hope it will provide an interesting aesthetic challenge, while T29 is my chance to try a tank suspension with adjustable hardness – and probably a firing mechanism, too. Then there are two cars: Nissan Skyline GTR which will be a smaller and hopefully faster successor to my Mustang Gymkhana, and Ferrari 599 Fiorano which will be my new supercar, trying to learn from lessons that my Audi R8 V10 and my Ferrari Enzo were. Then comes what is I guess the most surprising project, and a recent one: the USS Sulaco ship from the “Aliens” movie. My experiences with the ORP Orzeł model made me want to try something similar, and a ship like this in many ways resembles a submarine. Just like the ORP Orzeł, it’s intended to be a static model sitting on a stand, but with several motorized, moving elements and with some lights. Xenomorphs won’t be included but maybe my hamsters will agree to play their role. There is also Kenworth T600, my first big American rig since Kenworth Road Train from 2012. A lot of time has passed so I have to improve a lot: this Kenworth is supposed to have no NXT elements, but larger scale, a gearbox and much better aesthetics, which will be helped by foil stickers, custom chromed Lego pieces and by Dirt Grabber tires by RC4WD which look way more realistic than Lego tires (as shown above). Finally, two projects that have been waiting to get finished for a while: F1 car, which I put on hold because I want to drive it outdoors and it won’t happen until spring, and Akira Kaneda’s Bike, which was waiting for components that would make it work at small scale. I think the SBrick will be such a component, and I’m honored to say that I was allowed by Arvo brothers to re-use the stickers they’ve done for their excellent model. There will, no doubt, be some spontaneous builds too, and as usual I may have one or two secret projects up my sleeve. But in general, I want to exert more self-control this year because my primary goal remains to get more models finished and have less of them lying around and waiting for their turn. Happy – if somewhat late – New Year 2015! Ten czołg, który był na zdjęciu (po prawej, mniej więcej na środku) to jest T29, T32 czy T34 ? Sariel :@miguev It’s still in the plans but I probably won’t start it this year. Although maybe the new pneumatic parts will be useful for it. 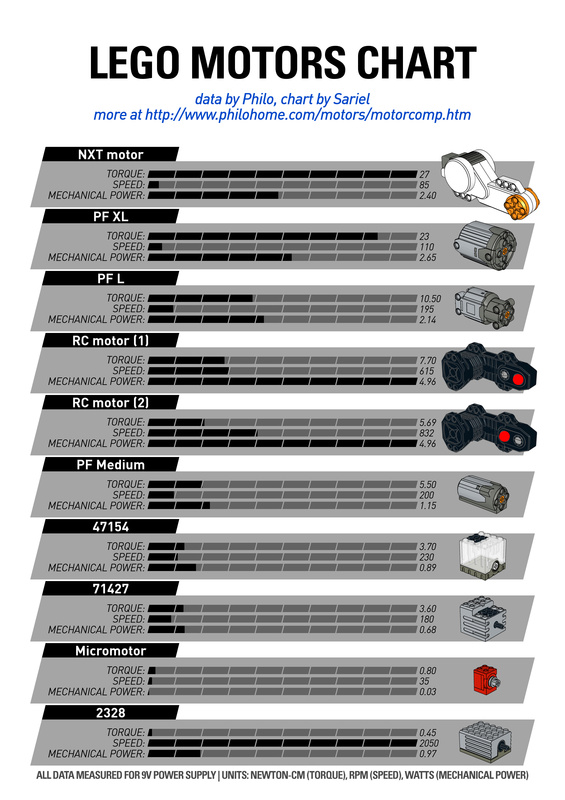 New pneumatic parts? Cool! what are they? It’s still in the plans but I probably won’t start it this year. Although maybe the new pneumatic parts will be useful for it. What ever happened to the low-floor bus you planned in the past? I think it’s an interesting challenge and I’m still hoping to see one such creation for you. @Sariel Well I’m a little disappointed but looking forward to it nonetheless. That’s seriously small for RC motors if that’s what your getting at. Actually, I have chassis already and it’s tiny. Basic suspension, small wheels, no extra functions. It’s about two thirds of my Mustang Gymkhana’s size, it’s crazily fast but very, very simple. I look forward to seeing your take at the Skyline GTR, if you get around to building it. You’ll find out that it has a pretty interesting multilink suspension which would be great to see in lego! Long and boxy, it should have plenty of room for Lego supercar functions too. Love your creations and I hope you have a good building year! Thanks. I don’t have the EV3 system and I don’t plan to get it in the foreseeable future. I’m pretty sure we can have a nice truck with cool functions without it. Your Kenworth road train is what got me hooked. That thing was peaches and cream front to back, but now we have the EV3 system and was wondering if you where going to mess around with it. also the Akira bike i can’t wait to see it.